Nothing Heartbeat Opera does is commonplace. The work of Co-Directors Louisa Proske and Ethan Heard is marked by daring originality and intense creative effort. The results continue to win new friends for opera. Last night, in partnership with Friends of the High Line, a fabulous free event right on The High Line introduced a vast crowd of New Yorkers to an art form with which many were unacquainted. If some were not opera fans when they arrived, they were surely opera fans when they left. 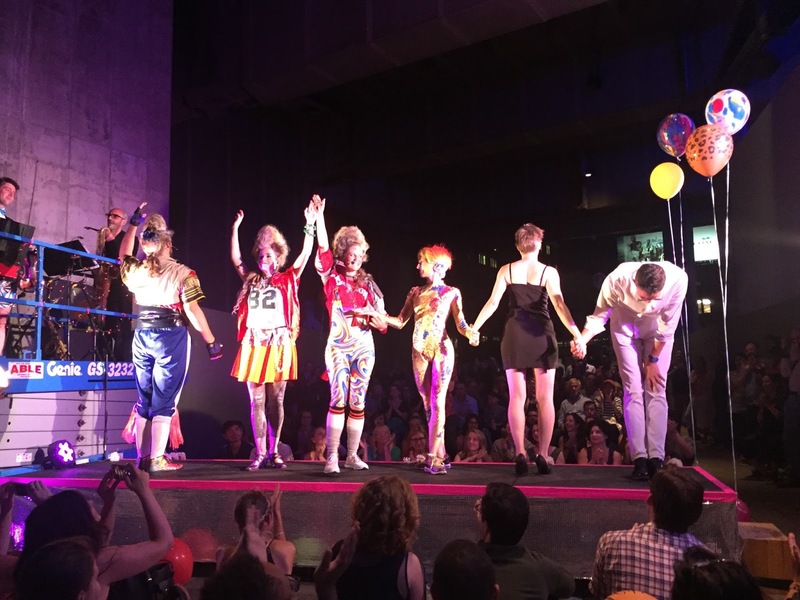 Heartbeat Opera originated when Yale graduates Ms. Proske and Mr. Heard undertook to take a fresh look at opera--not the way regietheater folk contort an opera to fit their own wacky ideas but rather by bringing out the wackiness of the art form itself. They have freed opera from the strictures of traditional performance in traditional venues and can be considered a shining light among the new and nimble small companies making opera compelling to young people. They have established quite a following. We personally had a blast and, since there were folks sitting on both sides of the thrust stage, we got a good look at other folks having an equally marvelous time. The cast managed somehow to keep moving so that each side got equal time. During "The Flower Duet" from Delibes' Lakmé, the "groundlings", seated on mats in front of the chair section, waved flowers back and forth in time with the music. Later, the flashlights on cell phones were similarly waved back and forth. Up close and personal, we all felt like part of the show. The three singers were well chosen to cover all the bases (except bass and tenor) and each artist was able to choose his/her own material, guaranteeing that heart(beat) and soul would go into each and every performance. Wisely, familiar pieces were chosen from the well-known operas of Mozart, Handel, Puccini, Verdi, Bizet, Rossini, and....Rogers and Hammerstein, thus lending authenticity to our dearly held belief that Broadway music represents the counterpart of "opera" in the 20th c.
The composers of Broadway musicals wrote music for the people of their time that was accessible in the way that Verdi was to Italians in the 19th c. Their works appealed to the masses with rip-roaring drama and characters with which the audience could identify, singing memorable tunes. The three singers were infallibly on point and incredibly entertaining. Although we have favorably reviewed all three before in better acoustics, we somehow didn't mind the amplification made necessary by the outdoor venue. Soprano Jamilyn White opened the program with "Quando m'en vo" from Puccini's La Bohème and was followed by Kristen Gornstein performing the "Habanera" from Bizet's Carmen. The two women harmonized beautifully in the aforementioned flower song--"Sous le dôme eépais". Baritone Joshua Jeremiah wooed the audience with "Some Enchanted Evening" from Rodgers & Hammerstein's South Pacific; he sang it with all the respect given to any operatic aria. He made a fine Don Giovanni to Ms. Gornstein's overly enthusiastic Zerlina who jumped onto his back in "La ci darem la mano". We enjoyed his "Largo al factotum" from Rossini's Il Barbiere di Siviglia; His voice melded beautifully with the women's in "Soave sia il vento" from Mozart's Cosi fan tutte. Ms. White drew great applause for her dazzling Queen of the Night from Mozart's Die Zauberflöte. There was no printed program but Emma Jaster, a tiny pixie of a dancer, wearing a flesh-colored leotard and a rainbow wig, bore placards announcing the composer on one side and the opera on the other--giving each side equal time. Happily, she was granted solo time and her corporeal expression of the ethereal "Meditation" from Massenet's Thaïs was heartfelt and beautiful to behold. Since we have arrived at a discussion of costuming, let it be noted that the baroque (in one sense of the word) and motley designs of Jon Carter added greatly to the fun of the evening. There were lots of spangles and spandex, vests and vestments. Wigs were baroque (in the historical sense of the word). MAC Cosmetics provided the materials for the wild make-up. We refer readers to our Facebook page "Voce di Meche" on which we will post an array of photos showing what words can only approximate. The musical arrangement by Co-Music Directors Jacob Ashworth and Daniel Schlosberg was just as original as the rest of the evening. A three piece band comprised a keyboard played by Mr. Schlosberg, a violin bowed by Mr. Ashworth, and an array of saxophones blown badly by an unknown musician. A couple sour notes failed to impair our delight. Producing director for the event was Jennifer Newman. Effective lighting was by Oliver Wason and equally effective sound design was by Harrison Keithline who gets props for not assaulting our ears with excessive amplification. Balloons were tossed and popped, flowers were waved, cell phones were waved, photos were snapped. We didn't see a single unhappy face. Yes, Virginia, opera can be FUN!